One can find the number of followers of a given tag. What is the meaning of this number? Is it the number of participant who are (reading ? )or writing(Q&A or comments) some thing on a post with that tag? So does it depend on time? Is it the number of online participants working on a post with that given tag? 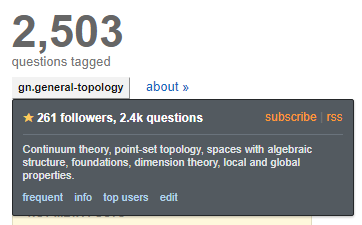 The number of followers is shown in the tooltip which is displayed when you hover over a tag. As already explained in comments, this is number of users who have the tag among their favorite tags plus number of users who have email subscription to new question in the tag. For more details see: What is meant by tag follower versus the “x number” that appears after a tag name? Next to the number of the followers you have a star. By clicking on it you can toggle between the possibilities: favorite tag/ignored tag/no special status. I will add links to the following question, when you can see also other ways how this can be done (although I think this one is probably the quickest); How do I follow tags? and What do “favorite tags” and “ignored tags” do? On the right you can see two links. One of them goes to the feed with the recent question for this tag. By clicking on the other one you can create email subscription for the given tag. And you can check for yourself that if you either follow the tag (by clicking the star) or subscribe to the tag (by clicking on "subscribe" and then following the confirmation link in the mail you receive) then the number of followers increases. The item below is the tag-excerpt for the given tag. And in the bottom you have links to this tags' frequent questions (=frequent tab), tag-info (=tag-excerpt+tag-wiki), top users (=highest total score of answers/questions in the tag). And the last link can be used if you want to edit the tag-info. Not the answer you're looking for? Browse other questions tagged discussion support tags favorites .